At Keen, we offer a wide range of welding consumable storage ovens to satisfy the most demanding welding requirements. Our high-performance products are manufactured exclusively in the USA at our facility in Hammond, Louisiana. We are currently one of the largest manufacturers of welding electrode and welding flux ovens in North America, and proudly serve welding industry professionals worldwide. The Keen KHTF-600 is a hopper-style, electric oven that is used for rebaking granulated submerged arc welding flux. It has a 600 lb. storage capacity and a temperature range of Ambient-999°F (Ambient-537°C). For subarc flux that has been contaminated by moisture, the high temperature KHTF-600 rebake oven is your answer. Highly efficient and easy to use, it is the perfect solution to restore up to 600 lbs of contaminated and/or recycled subarc flux. Why does granulated submerged arc welding flux need to be rebaked in an oven? Fused — this type of flux is non-hygroscopic (does not absorb moisture from the air). Any surface moisture on the particles can be removed at a low temperature oven setting of 300°F. Bonded — this type of flux is hygroscopic (absorbs moisture from the air) and is comprised of a combination of dry ingredients that are glued together with a liquid binder, then baked at a low oven temperature. Agglomerated — this type of flux is hygroscopic and is manufactured the same way as bonded fluxes only a ceramic binder is used instead of a liquid binder. Pre-Mixed — this type of flux is hygroscopic and is simply a combination of two or more bonded or agglomerated fluxes. The rebaking process refers to the short-term, high temperature heating of subarc flux that has been contaminated by atmospheric moisture. The rebaking process “reconditions” the welding flux, meaning it bakes out the moisture that has been absorbed thus restoring the flux so it is suitable for reuse. For specific rebake temperature guidelines, please contact the manufacturer of your consumable. Keen welding flux holding ovens and rebake ovens are an indispensable addition to any subarc welding operation to help ensure quality welds. Our flux holding ovens and rebake ovens are suitable for almost any flux heating application that is required for today’s professionals. Generally, there are two procedures involved with the proper maintenance of subarc welding flux: holding (also called storing) and rebaking (also called reconditioning). of the hygroscopic granules. There are various temperature requirements according to the type of flux and also that are also set forth by welding codes. For specific holding temperature guidelines, please contact the manufacturer of your welding consumable. The rebaking process refers to the short-term**, high temperature heating of subarc flux that has been contaminated by atmospheric moisture. The rebaking process “reconditions” the welding flux, meaning it bakes out the moisture that has been absorbed thus restoring the flux so it is suitable for reuse. For specific rebake temperature guidelines, please contact the manufacturer of your consumable. How is the KHTF-600 subarc flux rebake oven used in the field? Subarc flux is top-loaded by way of a hinge-supported lid that is easily lifted manually, and discharged through a slide valve located on the bottom of the unit. Handy, fixed steel bars that stretch across the hopper opening allow the easy emptying of new flux from unopened factory packaging. The flux bags can be placed across these bars, cut open and emptied into the oven hopper. When flux needs to be removed, a container is placed by the user beneath the hopper to catch the granulated flux as it is dispensed. The hopper unit is securely mounted onto a stationary, heavy-duty stand. What can you tell me about performance of Keen KHTF-600 rebake flux ovens? The KHTF-600 is ruggedly designed to withstand years of use in the most demanding industrial environments. Heavy-gauge steel is used throughout the unit and 4 inches of mineral wool in the oven walls and lid keeps the KHTF-600 flux oven well-insulated and energy efficient. The exterior features a durable powder-coated paint that is highly-resistant to industrial environments and will stand up to years of use. The KHTF-600’s hopper is has fully welded seams inside and out, and is securely mounted to the wheeled dolly by way of heavy duty screws. Thorough, energy-efficient and quick heating of welding flux is the hallmark of all Keen flux ovens. The KHTF-600 rebake flux oven in particular has twenty-seven elements evenly dispersed throughout the flux oven hopper cavity. When loaded with flux, no more than 2” of flux is without direct heating. It is important to note that our flux ovens are designed to reduce watt density to the elements, eliminating the problem of flux fusing to the heating elements which is a common problem seen in competing brands. Fusing of flux often creates a “gumming” effect causing the granulated material surrounding the elements to meld together. 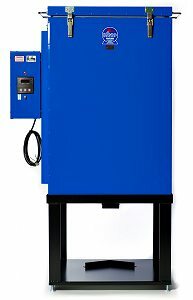 As standard equipment, Keen KHTF-600 flux ovens feature a UL® approved programmable PID microprocessor with digital temperature control and LED temperature-indicating display. The temperature reading can be displayed in either Fahrenheit or Celsius, and has a ±0.2 degree accuracy. Handy tactile increment/decrement keys on the controller’s water-resistant front panel enable easy temperature set point adjustment. The controller also features an on/off control mode. The standard control unit supplied with the KHTF-600 flux oven is programmable for standard operation, and an upgraded “ramp & soak” version is available. Keen ovens are specifically designed according to the temperature range of the process, and the amount of subarc flux to be stored. The standard holding ovens are designed to accommodate a maximum temperature of 550F and the rebake ovens are designed to reach 999F. The higher temperature ovens have larger wall thicknesses to accommodate more insulation and digital programmable temperature controllers. What is the procedure for recycling welding flux and what are slag screens? After the weld is completed flux that is not consumed can be collected and recycled to the flux oven hopper. However, contained in the non-consumed flux may be some contaminants such as slag, metal, mill scale, grindings, etc. that need to be filtered out before the flux is introduced back into the hopper to mix with new flux. Many manufacturers of sub-arc flux recommend maintaining a ratio of new flux to recycled flux. Some suggest adding 20% new flux by weight to recycled flux, others recommend a rule of thumb that one part new flux be added to three parts reused. It is always best to check with the manufacturer of your consumable for guidelines. Keen flux oven slag screens are designed to be a sieve for filtering out contaminants in reused flux as it is being poured back into the flux oven hopper. The hole size on our flux oven slag screens is standard, but we can adjust the screen hole size if you have a different requirement. The slag screens are a fixed size according to the flux oven with which they are used.